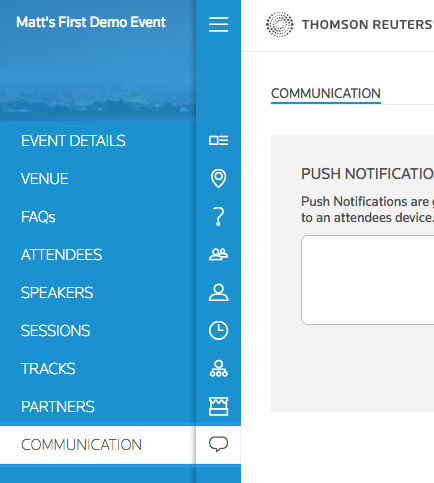 Use Convene Push Notifications to push announcements to your event attendees. They don’t even have to be actively using the app to get important notifications pushed to their phone. Simply, compose and send. Push Notifications are a real-time communications channel that you can use to push information about everything from the feasibility of late breaking schedule changes, to the promotion of high level sponsors, to announcements of adverse weather conditions. This communication channel should be approached with care. Abusing Push Notifications can have an adverse affect and cause attendee's to disable the feature, and they'll lose out on potentially important information. Carefully construct your communication plan and carefully guard the parties that have access to this feature. Step 1: From the Main Menu, select "Communication"
Step 2: Compose your message, brevity is key.